If you've been keeping an eye on the forums and/or the Games By Design blog, you'll know we've been planning quite a bit for the second half of the year. A new AI War expansion, completely redone art for A Valley Without Wind, and the reveal of our latest title Shattered Haven. Beta and pre-orders are imminent. I can't give an exact date (or rather I don't want to provide one and have something come up after that ends up changing it), but those looking for the first taste of the fourth AI War expansion won't have to wait much longer. Take a peak at the Marauder Starbase if you haven't yet. We're hoping for the beta to last around two months and then have an official release for Ancient Shadows alongside AI War 6.0 sometime in October. This has been building up for sometime. After deciding not to go with the Kickstarter route for several reasons, we'll instead be investing our own funds into fully redone art by Heavy Cat Studios. Full details here. Oh yeah, and we announced a new game! 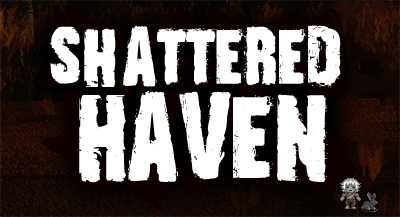 We're definitely excited about the developments for AI War and Valley, but we're flat out pumped for Shattered Haven (formerly Alden Ridge) and its beta/official launch later this year. This is a rather strange Thread for the Tidalis Sub-Forums... supposed to be in General mayhaps? It was posted in every game subforum. I gave Tidalis a sampling (I found the demo lacking so I pirated it for only a day to try out all the things)... and it just wasn't my kind of game, so I didn't buy it. I'm so awful at it... and the thing is, puzzle games have this nasty ability to make you feel like you're good, when it turns out you aren't. Early story missions or easy game modes don't really tell me how bad I really am at it. and I mean as far as I know, there's no way to make the game easier so I just didn't really bother. Um.. Um.. I feel really bad now, but for what it's worth I didn't keep playing it. I never do for games like that that I don't like/don't buy. I'm no fan of puzzle games at all, but I did have some 10+ hours of fun with Tidalis, but it isn't my genre, so I never got farther than that. Did pay for it simply to support Arcen though. Like... I would love to throw all the support I can at Arcen. I bought a second copy of AI War because when I bought it, I got it half off. But, I just can't buy something I wouldn't get use out of. That extra copy of AI War is going to a friend some day, and we'll play together. That's a fact. Tidalis? I won't get any fun out of it, because I just... didn't. The mechanics aren't for me. I can't seem to wrap my head around it to actually like, make combos or something. Anything that I did well was a complete accident. So, it's not bad, and it deserved to do well, I'm absolutely sure of that. So I mean... I did give it a shot at least I dunno. I'll support everything else instead, since I'm thinking I'll enjoy the rest of the games more. I'm spreading word as well, because they're the kinds of games I can't just... avoid talking about. ...I still feel like a terrible person. You're not a terrible person I didn't like it either. I'm no puzzleperson. Yeah I know I'm not... but like, demoing games that way really should only be happening with triple-A titles if anything at all. Triple-A titles are more likely to not have demos and not supply demos... or are more likely to just have a beta version as a demo for example with Duke Nukem Forever. Arcen's given more than adequate demos, as far as I know without even being asked for it. There was no service issue there and I can't fully really remember why I did it. So, I don't know. I'm okay, but given that I love indie games as much as I end up doing, I feel like I should throw as much support as I can at em. If I talk any more I'd be rambling but I don't have anything else to say. But there's no proper end to this post so... I'll just um... listen to the Tidalis title music? That song is lovely. Speaking for myself, I'd rather someone play one of our demos and while doing that decide that the game isn't for them and then not buy it, then to buy a game they ultimately don't like. Very much this. And thanks for all the support, folks! So you're saying I shouldn't buy a copy of Tidalis and hang onto it in my steam inventory for the rest of my life?